New York, NY - Fishing in saltwater is the ultimate test – of mental and physical toughness, and of tackle, from lure to rod and reel and everything in between. Oversized predators that swim in briny waters are experts at exploiting the weakest link in that long chain, in an effort to gain their freedom from an angler’s grasp. All too often, that inadequacy resides within the leader, linking the main line to an artificial or living bait, a leader that isn’t ready for what lies ahead. Seaguar, the world’s foremost authority and originators of 100% fluorocarbon fishing lines, is poised to introduce the thinnest, strongest leader material ever made. A leader with exceptional knot and tensile strength, complementing its innate abrasion resistance. A leader that is ready to withstand the rigors of saltwater predators and their unforgiving environment. A leader that will change the way you think about fluorocarbon. At ICAST 2018, Seaguar will unveil Gold Label. Seaguar Gold Label is designed to exceed the expectations of the most demanding saltwater anglers. The first superlative you’ll notice with Gold Label is that this 100% fluorocarbon leader is exceptionally thin. Indeed, for any particular break test rating, Seaguar Gold Label is as much as 23% thinner than any other 100% fluorocarbon leader made by Seaguar. Why does using the thinnest diameter in a 100% fluorocarbon leader matter? Mark Davis, Seaguar pro angler and host of BigWater Adventures TV, encapsulates the advantages by noting that, “the thinnest diameter leader at any pound test rating means that with Gold Label, I can make extremely stealthy presentations without the leader impeding the bait’s natural action and bite-triggering abilities.” Baits rigged on Seaguar Gold Label will swim more naturally, triggering more bites and putting more fish in the box than ever before. Gold Label’s paradigm-shifting characteristics are made possible because Seaguar, the originators of fluorocarbon fishing lines, is still the only company that completely controls every aspect of fluorocarbon line production, from resin development and preparation to extrusion, winding and packaging. Indeed, Gold Label is prepared using Seaguar’s proprietary co-extrusion method that yields a unique Double-Structure leader. This exclusive process unites two different fluorocarbon resins: a strong, sensitive fluorocarbon core and a soft, supple, fluorocarbon exterior, into the finest leader available, one that has earned the title of Gold Label. This is not hype or hyperbole; it’s science and fact. Seaguar Gold Label will be released in six versatile pound test ratings, ranging from 15 lb test to 40 lb test, on 25 yard spools. Look for Seaguar Gold Label on shelves in early 2019 with MSRP $18.99-34.99 depending on pound test. Mark Davis concludes by noting that, “big fish aren’t lost, they are given away. With Gold Label, I’m not giving those memory-makers away; I’m turning them into TV stars instead.” Seaguar Gold Label sets the new standard in premium 100% fluorocarbon leaders – fish it once, and you’ll understand why Seaguar Gold Label is Always The Best! As the inventors of fluorocarbon fishing lines in 1971, Seaguar has played a prominent role in the advancement of technologies to improve the performance of lines and leader materials for both fresh and saltwater anglers. 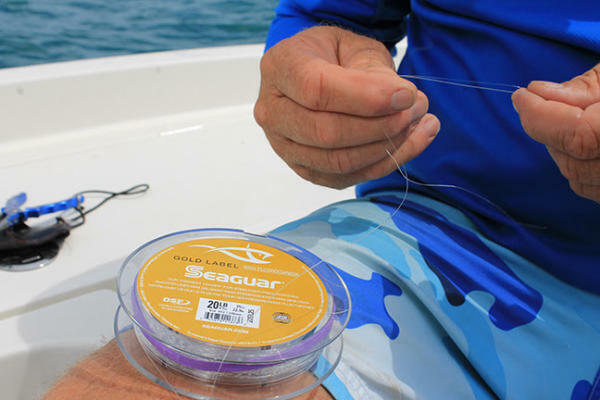 Seaguar is the only manufacturer of fluorocarbon fishing lines that produces its own resins and controls the manufacturing process from start to finished product. Today, Seaguar is the #1 brand of fluorocarbon lines and offers a full spectrum of premium products including fluorocarbon mainlines and leader material, fly tippet and leaders, 8-strand and 16-strand braid and monofilament fishing lines.